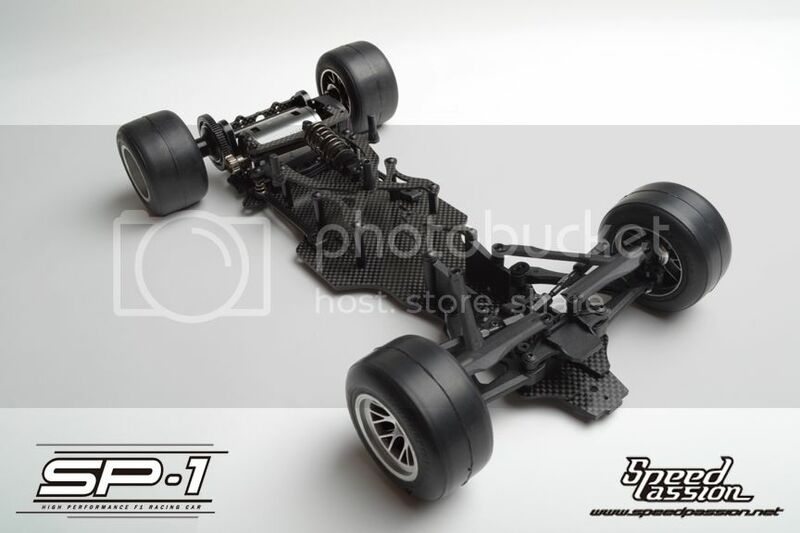 Speed Passion introduces the SP-1 F1 1/10th scale chassis, an innovative and unique F1 chassis that is the result of creative design and development. 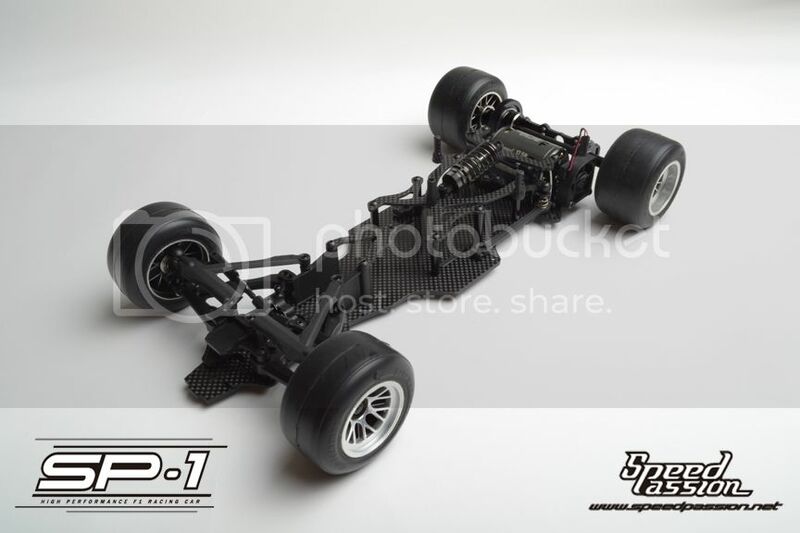 Similar to full size F1 cars, the SP-1 F1 1/10th scale chassis utilizes a high quality 3mm streamlined carbon fiber lower chassis, a 2mm upper deck, and lightweight 7075 aircraft grade aluminum. Chassis stiffness can also be fine tuned using 6 chassis spacers depending on track conditions. Aluminum components, such as the rear pod and center shock are anodized with a stealth black finish. 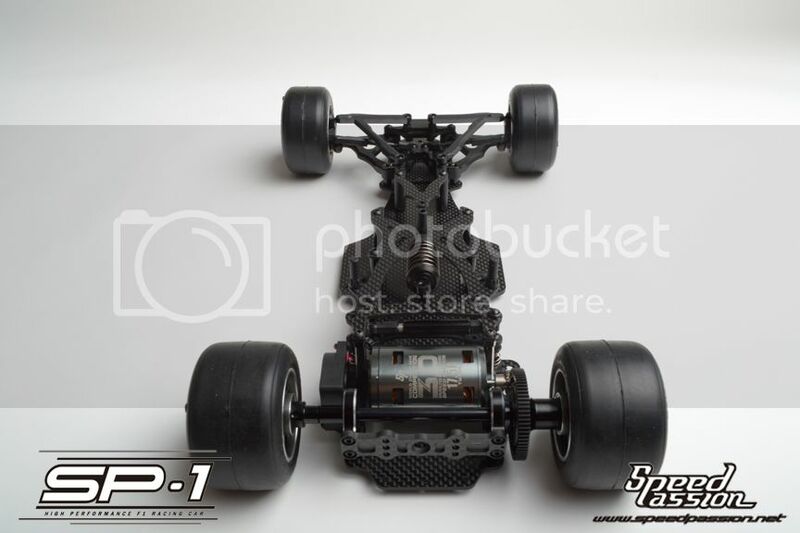 The SP-1 F1 1/10th scale chassis also allows different lipo battery positions and configurations. 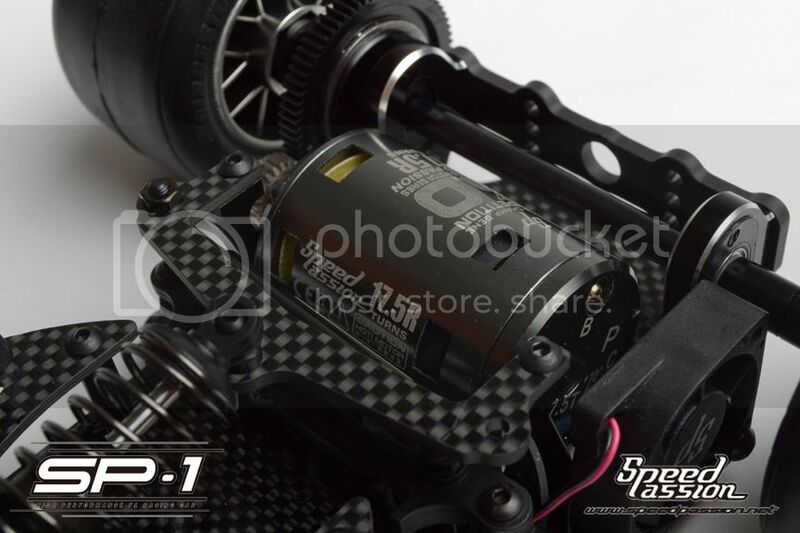 The SP-1 can fit regular size 2 cells lipo battery or the shorty 2 cell lipo packs. 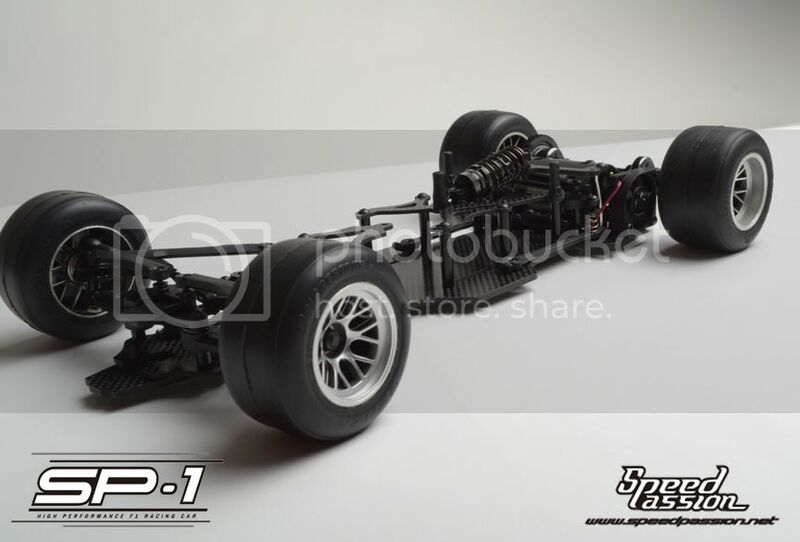 The SP-1 F1 1/10th scale chassis represents Speed Passion’s high quality standards on and off the track as racers can put the chassis’ craftsmanship and attention to detail on display. 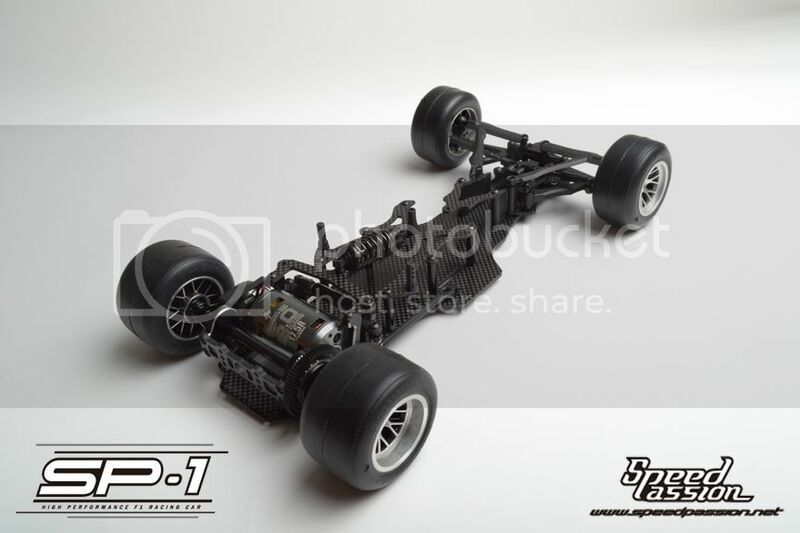 The SP-1 F1 1/10th scale chassis was designed with a precision balanced rear motor pod. The rear motor pod design ensures allow precise control and balance when entering and exiting corners which allows drivers to easily carve the fastest line around the track. The rear differential utilizes high quality pressure plates along with 12 carbide differential balls for smooth differential action. 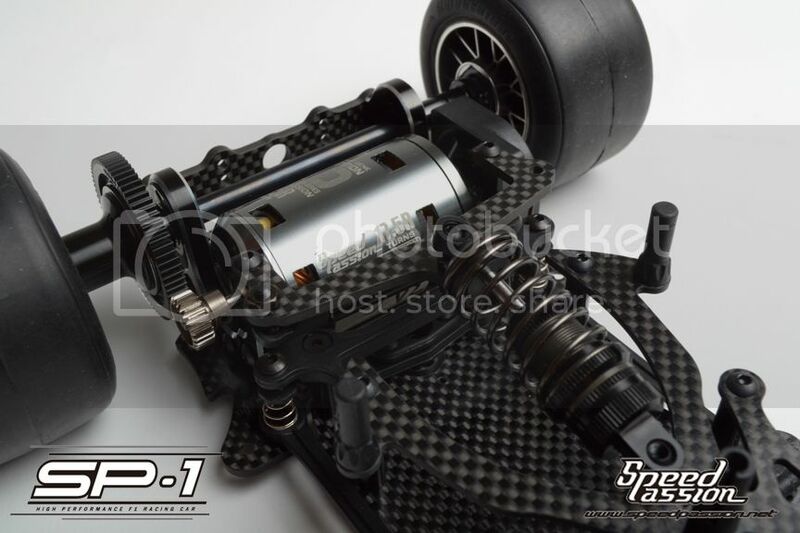 The SP-1 F1 1/10th scale chassis suspension is designed with an innovative dual bellcrank steering system that allows the Ackerman to be fine tuned for precision control. The suspension also allows for infinite camber adjustment and 5° and 10° caster blocks for any type of track condition, indoor or outdoor, carpet or asphalt. Optional front springs can be quickly changed as track conditions change. 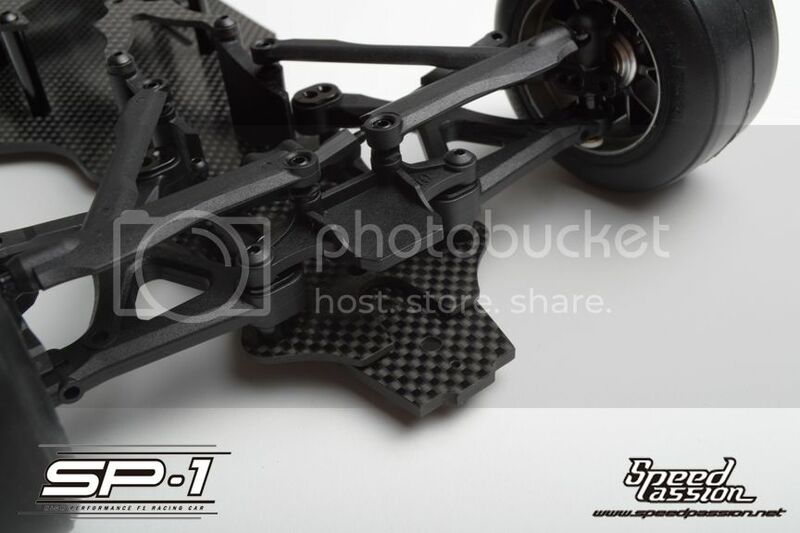 The adjustable track width (front and rear) allows the SP-1 F1 1/10th scale chassis to adapt to the various F1 racing specification throughout the world. The track width can be adjusted to 190mm and lower with rubber tires and can be adjusted to 200mm when using foam tires. 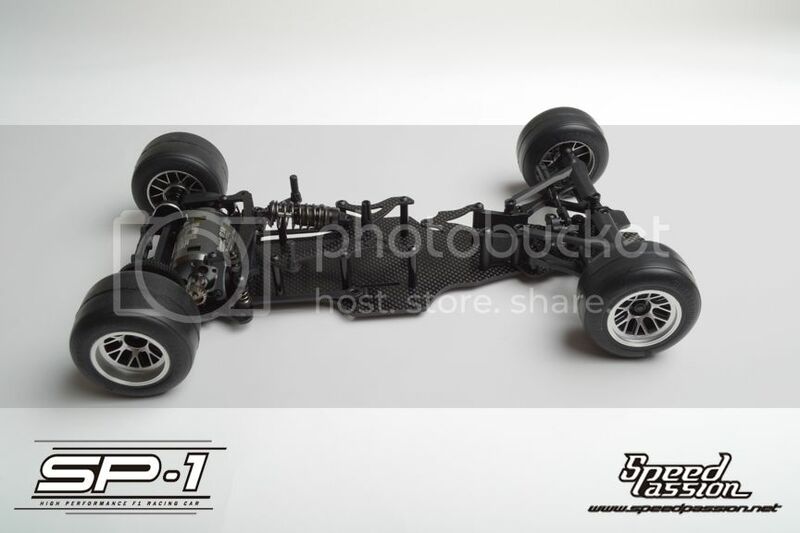 With optional parts, the track width can be adjusted the F1 world spec of 185mm. 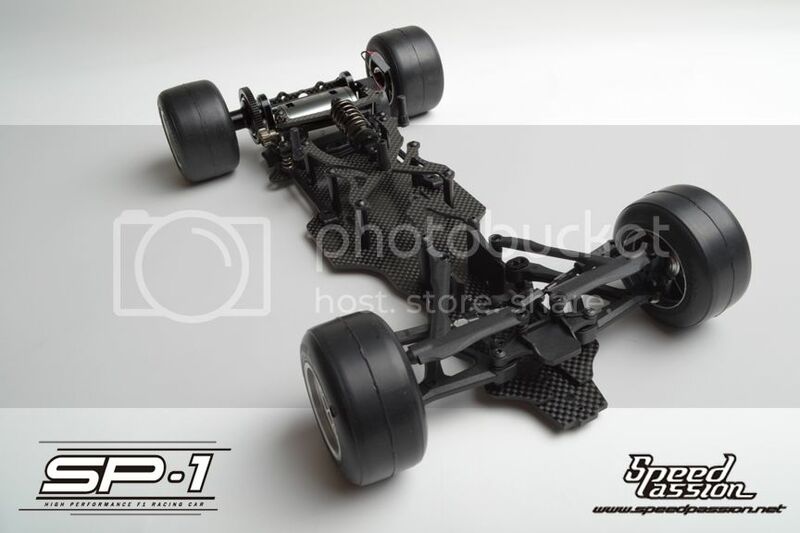 The SP-1 F1 1/10th scale chassis can adapt to various aftermarket foam or rubber tires. 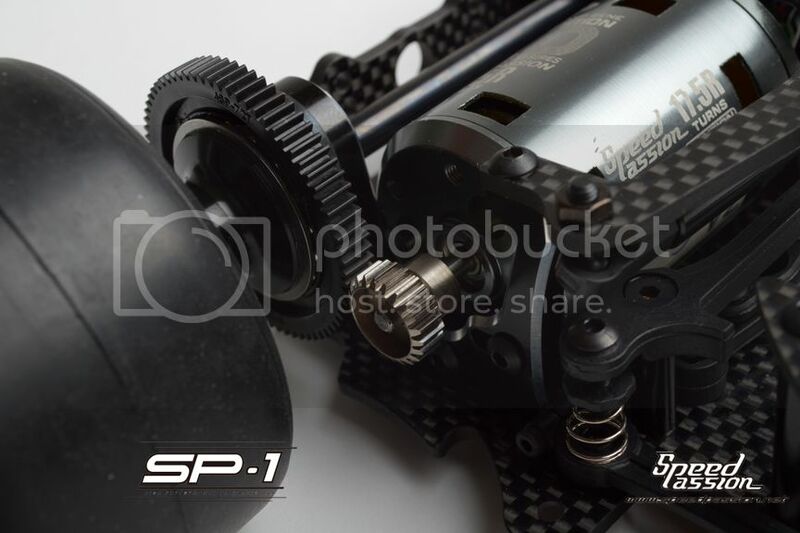 The SP-1 F1 1/10th scale chassis is designed with a centrally located, large volume shock that is attached to a carbon fiber mounting plate. The result of is stability and traction on high speed track sections and total control in small, tight, sections. These characteristics are not easily found on today’s crop of F1 chassis’. The SP-1 F1 1/10th scale chassis includes multiple medium and high downforce front and rear wings, made from high quality lexan. The structure for the wings are made from durable FRP material to prevent any sort of tweaking which would affect the downforce. The adjustable rear wing has been designed to provide balanced and stable high and low speed cornering. 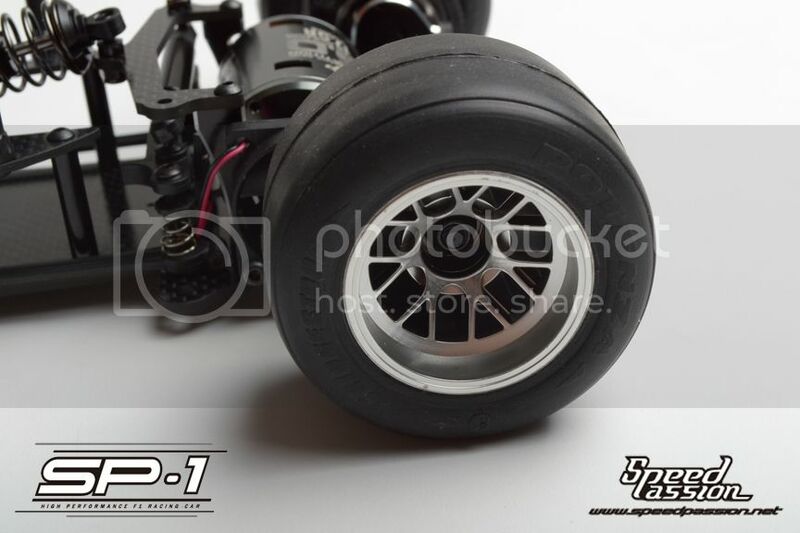 High quality option parts for the SP-1 F1 1/10th scale chassis include a full aluminum motor pod, various shores of foam and rubber tires, aluminum preset camber blocks ranging from 0° to -2.5°, and aluminum caster blocks in multiple angles. 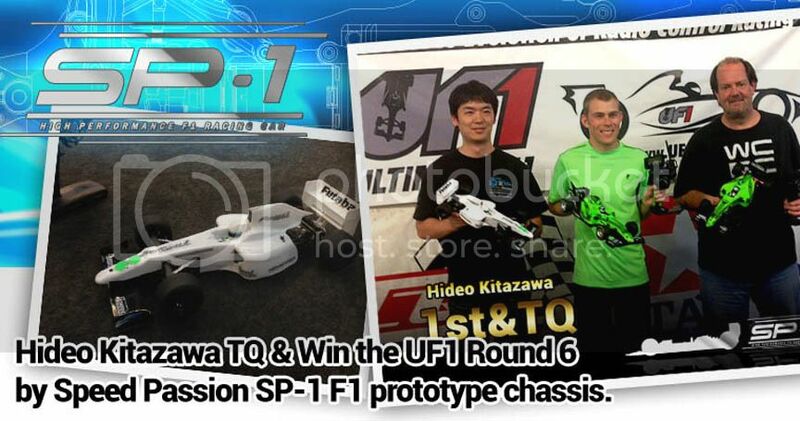 Prototype testing and racing by Futaba's own Hideo Kitazawa, TQ & Win the UF1 Round 6 by Speed Passion SP-1 F1 prototype chassis. Any way to see how the servo is mounted in the front to the bellcrank? 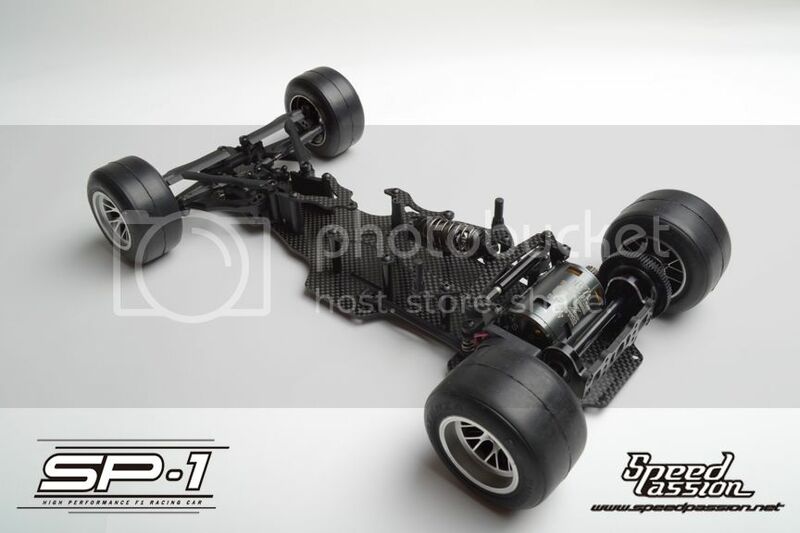 Speed Passion brand new F1 kit - THE SP 1 (pre-order special link below)...ETA delivery early April 2013. I want one and we don't even run F1 at our club. Just put my pre-order in. I can't wait this thing looks ridiculous! You have my address. I expect one in my mailbox when they land. Ahh, a proper way to let the world know about a new product. I do have a few questions. 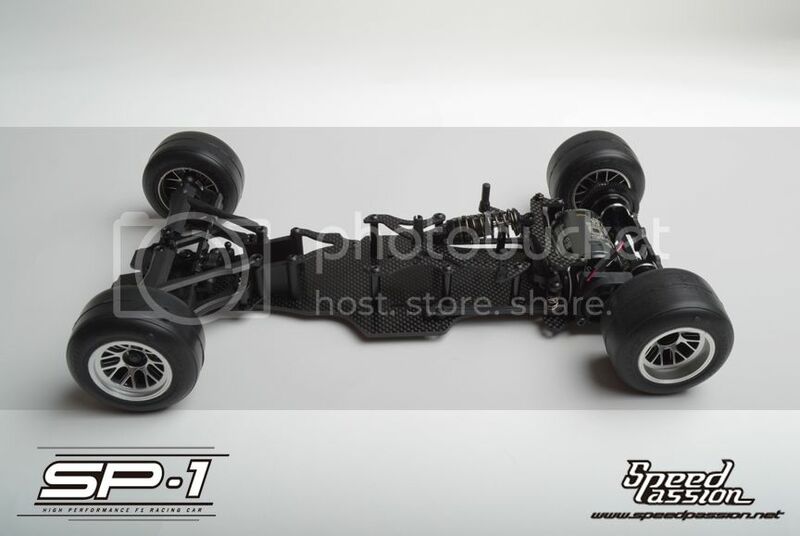 - Is Speed Passion offering their own body shell for their F1 car? 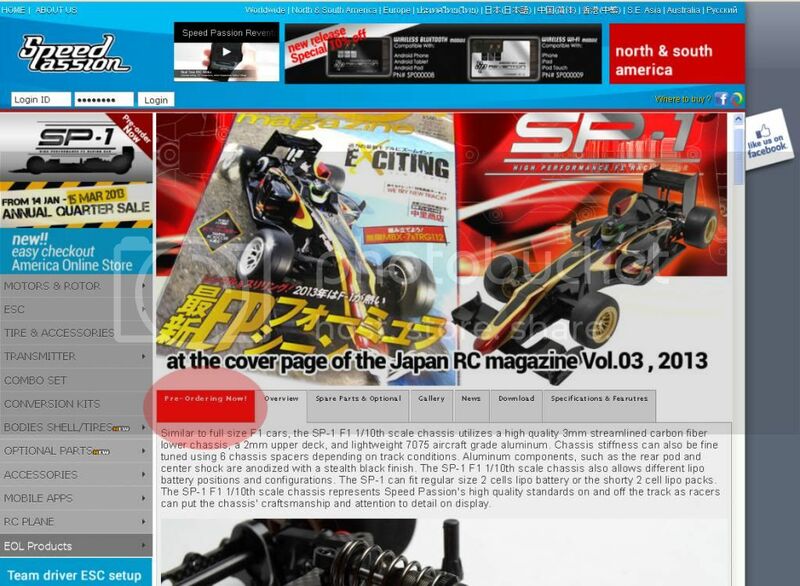 - Does Speed Passion have their own wheels for their F1 car? Great looking car and great features! I only have 2 minor issues with the car...the first is it looks like 185mm is the minimum you can take the width to instead of 180mm like the Tamiya. For the most part this shouldn't be an issue as most races seem to favor 190mm as the max width but there may still be a few clubs running a 180mm rule. 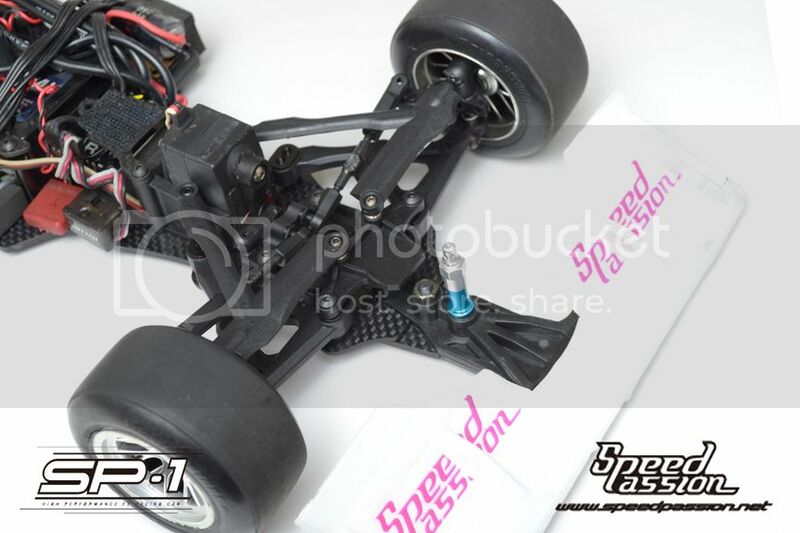 The second is the left side rear axle looks a bit more exposed than the Tamiya and may be prone to bending or breaking. How do you secure the motor with only the one screw? There are 2 screws at the bottom of the motor mount to secure the motor...not just 1. We will have a optional silver can motor mount for spec brushed motor that required 2 up and down motor holes. Ah! I didn't see a second screw hole due to the contrast of black on black in the photo. I see it's similar to the mounting on the AE TC6.1. I saw that from the backend, I think you just beat BRAD by 2 spots....thank you. UF1 has open tire rules just in case anyone was confused. Cool! This car is at the right price point for all the features. That is even better....the SP-1 will fit any rubber tires. When using the 185mm F/R setting even with the TCS tires and will fit the 190mm rule. However, I want to know is there any concern about being OPEN TIRES..? 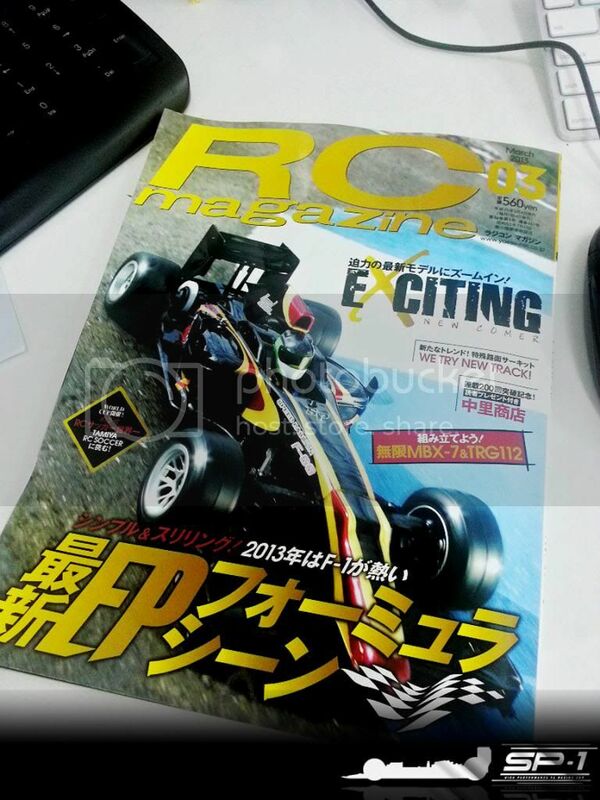 Does some of the RIDE, Pit Shimuzu or TRG brand has wide offset or something odd..? 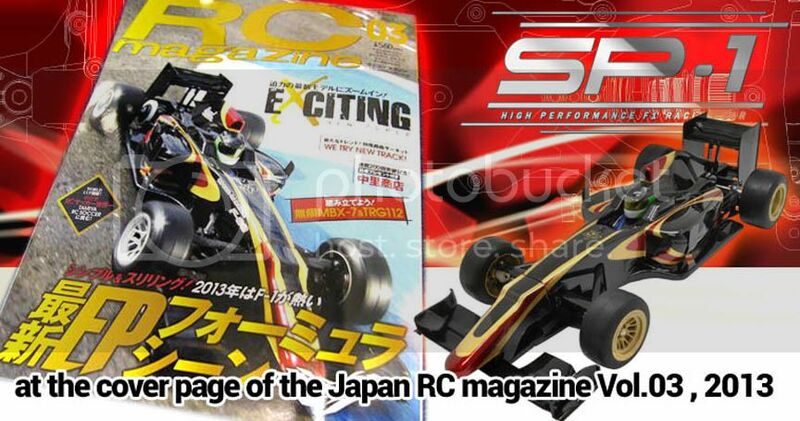 I know RIDE just release the +3mm for the Japan open class market...but I doubt those will be used in USA. Good idea! It would be great to finally see a car come out of a box that needs only a receiver to run out front from the start. Actually, it need battery....if LIPO is what most ppl want to use (LIPO is hard to ship via AIR now a day)....Radio, is 2.4 with LCD screen, it is not some cheap stuff. car is READY to race with SP Reventon Stock Club Race ESC along with V3 competition 21.5 motor that match most of the F1 rule around the world. That is a very impressive package! A battery, a charger and DONE! I'm on the pre-order list. There's just something about the scale looks of a car that makes racing that much more fun. Now it's time to find a late model body and wing and acceptable electronics that meet the F1 rules. Open tires can be a good or bad thing depending on how you look at things. If you have a set "standard" car...meaning the cars conform to a certain specification and fit in a set dimensional box, then a spec tire is a good thing to keep costs down. 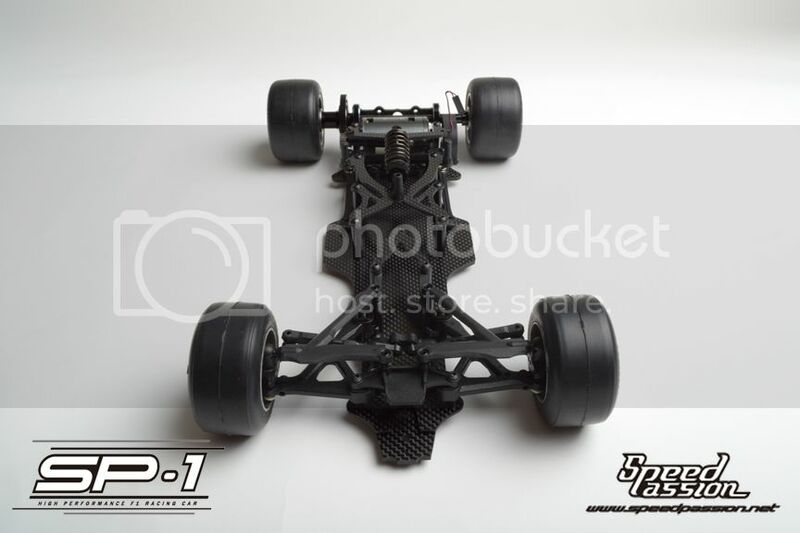 Right now F1 RC cars are a little over the map in terms of what features or tuning you can do to them and how wide they are. You have T-plate cars, Link cars, simple front suspension king-pin coil over to the now very innovative Speed Passion front end, which is a coil over double wishbone front end. Very neat! Because of this, a spec tire may favor one design over the other. This is especially true now since we have 180mm and 190mm car widths as well. With open tires all players have a chance to compete and do well. Granted this makes it a little more expensive, but until F1 standardizes or the class is split to keep cars with a certain dimensional and specification box in the same playground, open tires seems to be the only thing to keep everyone's toys competitive for now. So what are the prices? Fred.....Thanks for the explanation and I think I am welcoming the open tires rule. To be honest, our car encounter some major design problem when trying to find out how WIDE that we can go...in Japan and HK (also part of China), the F1RC are all 200mm with foams....rubber tires are not welcome nor care by then because they are running full mod, sometime with boost. The current 185~190mm setup with rubber tires are exactly something they will not consider...total opposite to what we are running. And about open tires...I think as long as we can easily obtain those mfr such as Ride, Pit Shumizu, TRG or even the TCS spec rubber tires....open tires or not, is all up to the racing organization to be spec. But I just hope, in USA, will stick with RUBBER TIRES instead of letting the FOAM GATE open. Pardus is doing something alot of ppl want to see, they provide something affordable and still good enough to race indoor carpet and outdoor. The TCS spec rubber tires are a good choice to use....RIDE is definitely the best to have but they are not easy to get and not easy to swallow in price...but the key is still the LEGAL WIDTH of the F1 has to be set. 190mm outside to outside...then customer will choose the tires of their choice and set their chassis width to met the legal specification. So what is included in the car kit? Does it come with the nose, rear wing, body, tires or a fan? All times are GMT -7. It is currently 05:28 AM.